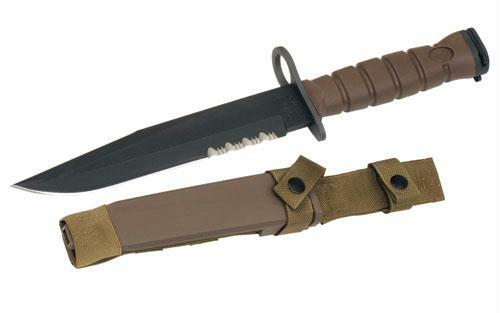 The Ontario Knife OKC3S Marine Bayonet is is used and issued exclusively to the United States Marine Corps. This knife is unique in the fact that the blade is constructed using a thick proprietary blend of carbon steel. It has a non-reflective finish and ergonomically grooved Dynaflex handle to reduce hand fatigue. Situated in New York State’s scenic Southern Tier, Ontario Knife Company produces one of the most comprehensive, wide-ranging product lines in the cutlery industry today. While being a worldwide supplier, the Ontario Knife Company is also a major supplier to the U.S. Government and its military. Ontario has built its reputation on a heritage of uncompromising craftsmanship, quality materials and components, and a steadfast commitment to its workforce A partially serrated blade with a 1.75 mission serration. Manufactured with a low noise signature polyester elastomer in the handle. Fitted internal stainless steel spring friction to secure bayonet. Includes a ceramic coated honing rod located on the back of the scabbard which is equipped with two load bearing attaching straps with cross straps. Includes glass filled nylon sheath.